See Samson at the Sight & Sound Theatre, and attend Branson Summit 2019, all for $90 per person. Order before Sept 1, 2019. 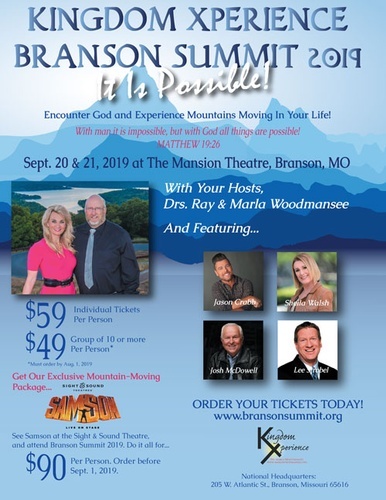 Kingdom Xperience Branson Summit 2019. Encounter God and Experience Mountains Moving in your life! Featuring Jason Crabb, Sheila Walsh, Josh McDowell and Lee Strobel.